1. Make sure the entire Vandals team shows up. 2. Defeat a flex defense that, long before PSU, may last have been run by the Dallas Cowboys in the 1980s when Hall of Fame defensive tackle Randy White was leading it. The second might be the surer thing. The Vikings’ flex this year has been torched for 72 points by Nevada, 62 by Oregon and 43 by Montana State. All were PSU losses. The Vikings’ lone win is against the College of Idaho, 63-14. Idaho coach Paul Petrino said the Vandals don’t see the flex much. As employed by Dallas decades ago, it featured a lot of shifting along the defensive front, attempted to free a middle linebacker to make the majority of tackles and relied heavily on man-to-man coverage that began at the line of scrimmage. This is what Petrino expects to see from the Vikings: Semise Kofe (6-foot-1, 310 pounds) is PSU’s Randy White. “He’s in the backfield a lot,” Petrino said. Idaho’s leading rusher, Isaiah Saunders (126 attempts, 506 yards and two touchdowns) sees the coverage scheme and lights up. “We’re going to look to the receivers to open the run game for us,” he said. On offense, the Vikings have a capable tight end in preseason All-America Charlie Taumoepeau (6-3, 240), who scored four total touchdowns against Nevada and Oregon and caught passes for more than 100 yards in each game. “He looks good. He’s made big plays against everybody they’ve played,” Petrino said. Wide receiver Emmanuel Daigbe, a sophomore, is a deep threat with five catches for 100 yards this year. Mataio Talalemotu is a redshirt freshman. He has caught 11 passes for 139 yards. Idaho’s biggest challenge is to avoid the lethargy that seemed apparent throughout the loss to UC Davis. 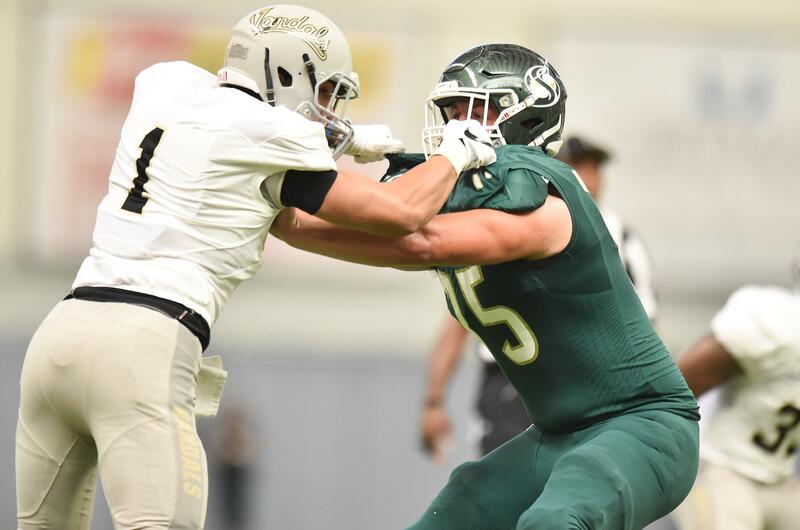 Middle linebacker Christian Elliss described it as the mind knowing what to do but the body not being able to carry out its assignments quickly enough. Petrino pointed out Elliss is playing a new position as a middle linebacker, and the Vandals simply have to live with a learning curve as he gets up to speed with making defensive calls while still being able to play with abandon. That said, Petrino was all about making practice for the Vikings a weeklong exercise in accountability and consistent effort. “There could be a different person start at every position,” he said. Sophomore quarterback Colton Richardson left the UC Davis game in the second quarter with an injured throwing hand. Petrino said Richardson was day-to-day, but he hoped to have him back against the Vikings. Junior Mason Petrino, who has alternated with Richardson, completed the game against the Aggies at quarterback and threw for a career-high 284 yards and three touchdowns, with one interception. The Vandals, at times, have looked adept at running their offense, coach Petrino said. But they need to be consistent about converting short third and fourth downs and scoring in the red zone. “When we get down there, we’ve got to score touchdowns,” he said. Published: Sept. 28, 2018, 7:51 p.m. Updated: Sept. 28, 2018, 8:09 p.m.